From time to time, Porky LeSwine likes a diversion from blogging about North Carolina barbecue. And he likes it even more when said diversion is courtesy of a BBQJew.com reader. Thus, we thank reader Steve for the following note, which he agreed to let us share with the world. 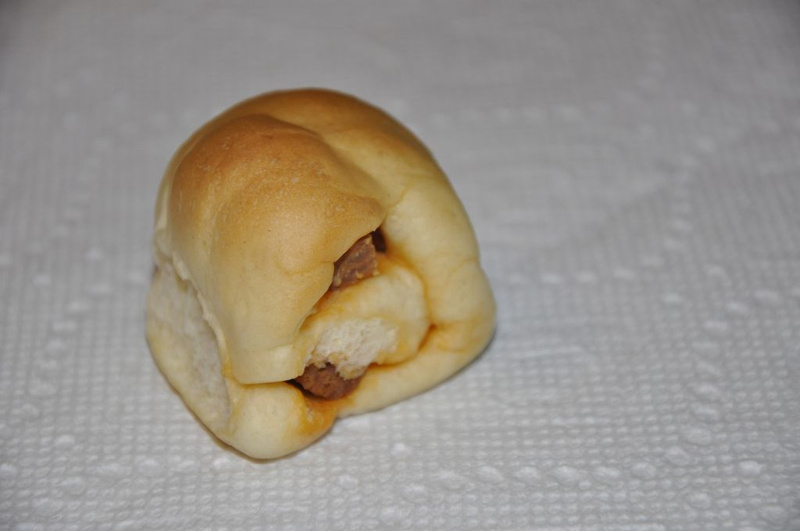 Dear Porky, If I may let me talk about something that is not North Carolina Pork BBQ: the West Virginia Pepperoni Roll. I have family in the Clarksburg, WV area and one time while visiting, I found this snack in the local gas stations. Take a few sticks of pepperoni, encase it in bread dough, and bake. The spicy grease from the pepperoni soaks into the bread as it bakes. Deliciousness. The only place that I have seen them here in NC is Yosties, a bakery and eatery in Faith, NC, right down the road from Wink’s King BBQ and Seafood in Salisbury.Pepperoni Rolls were invented in the Fairmont, WV area some years ago. I have heard and read a couple of different stories. One I was told by an Aunt who lived in the area related that they were invented by Italian mothers as a treat for their children. Another account is that they were invented as something to sell to the Sicilian miners in the area. There is a very large Italian community in the area. The next time that you are near Salisbury, you might want to go a few miles down Faith Road and pick up a few pepperoni rolls at Yosties. They also have great cinnamon rolls and cheese straws. Thanks for sharing, Steve. This is definitely the first I’ve ever heard of pepperoni rolls, and for all I know I may never hear of them again. But hopefully someday I will eat one. Now back to our regularly scheduled barbecue programming. I’ve not thought much about it up here (Southern NJ/Philadelphia), where it is called pepperoni bread (using sandwich pepperoni), and it can be found it bread bakeries. Google the name for recipes. It is similar to a stromboli. I have rarely seen it served as roll though, and never with stick pepperoni. Hebrew National Salamin/Summer Sausage strips are awesome in a roll. Darn good fire grilled also. I live in Durham, NC and hail from central West Virginia. My wife grew up in the Clarksburg, WV area and has an Italian mother so I know my pepperoni rolls. I grew up eating pepperoni rolls and they made regular appearances on my school lunch menu. Fundraisers often took the form of fresh baked pepperoni roll sales! Although the pepperoni roll can be difficult to find in NC, they’re easy to find in Myrtle Beach. D’annunzio’s has a shop there now!